Brad GoodHale carves up a turkey while hosting college students who study abroad and are not near family for the holiday. 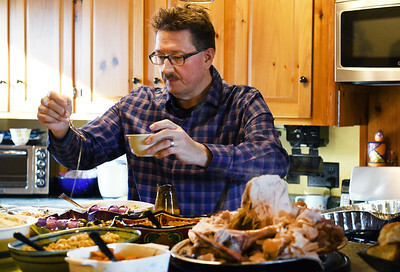 Brad GoodHale puts the finishing touches on the Thanksgiving meal at his residence in Rutland Thursday afternoon. 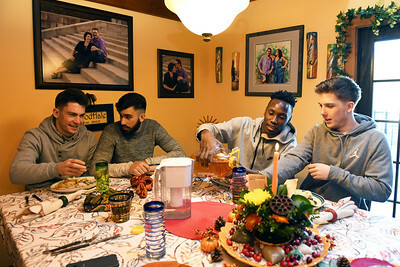 GoodHale and his wife Donna opened up their home to local college students who are studying from abroad in Vermont. 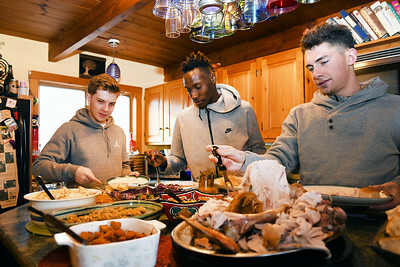 Eric Shaw, right, guard for the Castleton University basketball team, gets a serving of turkey with his teammates Oluwadare Sowunmi, center, and Josh Watts at the GoodHale residence in Rutland on Thanksgiving Thursday. The trio joined other college students at the GoodHale's residence who host students studying abroad for the holiday. 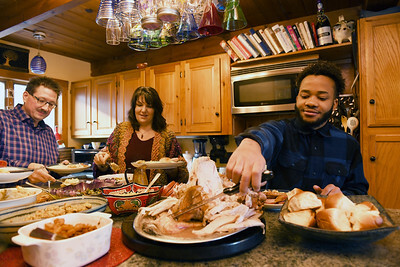 Donna GoodHale, left, smiles as guests dig in at their Thanksgiving meal Thursday afternoon in Rutland. GoodHale and her husband Brad cooked a large meal for college students who have family abroad.